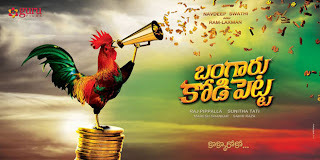 Navadeep and Colors Swathi are Gear up with a new film titled 'Bangaru Kodipetta.' Raj Pippalla is going to direct this film. Previously he directed Sumanth, Kriti Kharbanda starrer as 'Boni'. Sunitha Tati is making her debut as a producer and she's going to produce this film under the banner of Guru Films. Mahesh Shankar is going to compose the music with soft and his own rocking style. The film will go on floors soon.